After much anticipation, Final Fantasy XV is the newest installment to Square Enix’s legendary franchise. Whether you’re a diehard fan or just starting your adventure this year, our wig suggestions will help you achieve your dream Final Fantasy cosplay! Our Apollo was made for spiking which makes it perfect for the spiky haired Noctis. If you’d like some more length to your bangs, look no further than our asymmetrical Aphrodite which is long in the front and short in the back. Our classic Black color is the perfect shade for this prince of darkness, but Gunmetal Grey will give you a softer, lighter look. Our Hestia has the long, elegant curls every princess needs, so it’s the perfect choice for Lunafreya. Just style it into an updo and use our wefts to attach in her braided headband. If you want a more convenient option, our Phoebe is already pulled back into a ponytail. Natural Blonde is the only blonde for her. Our Atlas comes built in with a natural looking hairline that makes styling it for Ignis a breeze, but you can achieve the same effect with our Apollo by adding in an artificial hairline. If you’re not sure exactly what that entails, you’re in luck! We have an artificial hairline tutorial coming soon to help you out. Since his hair color tends to vary, you can choose between Sandy Blonde or Light Brown to see which suits your sophisticated look better. If you want to cosplay Gladiolus, you’re probably already prepared to rock a mullet. You can use our Atlas as a starting base and sew in wefts at the bottom. Or, if you don’t want to buy the extra wefts, our Helios comes with all that shaggy length included. Just trim down the rest to order and add in an artificial hairline. If you’re not sure exactly what that entails, you’re in luck! We have an artificial hairline tutorial coming soon to help you out. Our Dark Brown is the only color you’ll need. 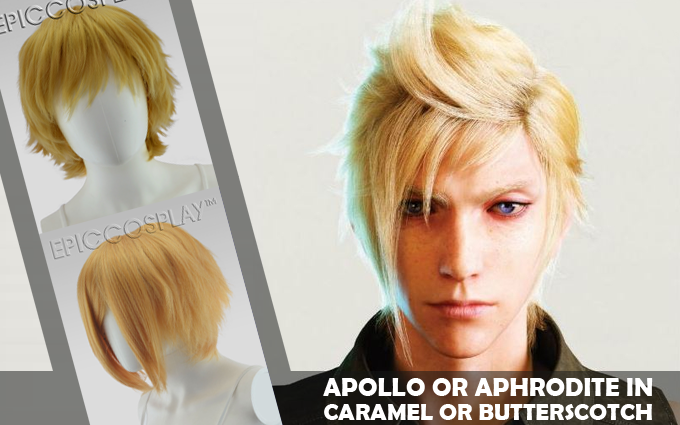 If you want a versatile wig that’s easy to spike, our Apollo will help you achieve Prompto’s cockatoo hair flip. If you want a little more bangs to frame your face, our asymmetrical Aphrodite will work just as well. You can use heat styling to set your bangs into a part for both. Both our Caramel Blonde and Butterscotch Blonde are rich, vibrant colors for you to choose from.